Fred Olsen Cruise Lines wins top cruise accolade in the '2014 Group Travel Awards' for a record fourth year in a row! Fred. 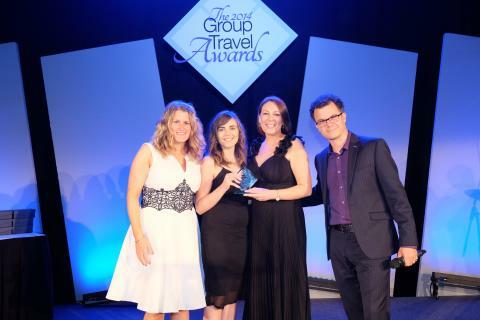 Olsen Cruise Lines has been crowned ‘Best Cruise Line Operator for Groups’ by readers of Group Travel Organiser magazine, in its prestigious ‘2014 Group Travel Awards’, for the fourth consecutive year. Fred. Olsen beat off stiff competition from the other nominated cruise lines – Norwegian Cruise Line, Cruise & Maritime Voyages, Hurtigruten and P&O Cruises to carry off the top prize. Fred. Olsen’s Ellie Fulcher, Group & Specialist Sales Manager, and Sophie Austin, Group & Specialist Sales Executive, were presented with this coveted award by Abbe Bates, Editor of GTO Magazine at a glittering ceremony held at The Park Plaza Riverbank Hotel. Due to increasing demand from groups wishing to enjoy Fred. Olsen’s very special holiday experience, the cruise line set up its dedicated groups department in 2009 and has not looked back since. Fred. Olsen's bespoke groups service appeals to those travelling in a group, with family or friends, or with their local club 'also specialise in corporate and incentive group travel and can offer an entire ship for an exclusive full ship group'. - Group leaders receive a free cruise place when they achieve their group passenger target, of 20 guests. *Full Terms and Conditions are available from the Group Sales Team, upon request. Photo caption: (R-L) Abbe Bates - Editor of GTO Magazine, Sophie Austin - Group & Specialist Sales Executive at Fred. 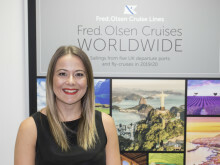 Olsen Cruise Lines, Ellie Fulcher - Group & Specialist Sales Manager at Fred. Olsen Cruise Lines and Comedian Dominic Holland. Fred. Olsen was also named ‘Best Affordable Cruise Line’ and runner-up ‘Best Cruise Line’ in the ‘Cruise International Awards 2013’, and ‘Best Value for Money’ in the Cruise Critic ‘Editors’ Picks UK Awards 2013’.